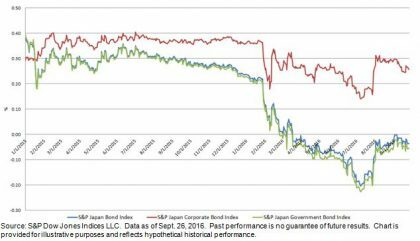 Since the Bank of Japan announced a negative interest rate policy earlier this year, both government and corporate bond yields have decreased (see Exhibit 1). After hitting a record low yield of -0.23% on July 8, 2016, the S&P Japan Government Bond Index rebounded following a modest stimulus announcement later that month. As of Sept. 29, 2016, the yield was hovering around -0.05%. In terms of market size, growth of the Japanese government bond market has been steady in recent years; it expanded 5% YTD as of Sept. 29, 2016, and it increased by a multiple of four, to JPY 1,115 trillion, since the index was first valued in 1998. The S&P Japan Government Bond Index rose 3.87% for the year as of the same date. The yield of the S&P Japan Corporate Bond Index held up relatively well; it only tightened 16 bps YTD as of Sept. 26, 2016, to 0.22%. Among all the sector-level subindices, the S&P Japan Utilities Bond Index had the highest yield, at 0.43%. The market value of the Japanese corporate bond market stood at JPY 75 trillion, representing 6.3% of the overall bond market. As for total return performance, the S&P Japan Corporate Bond Index gained 1.09% YTD as of Sept. 29, 2016. The S&P Japan Bond Index is designed to track the performance of local-currency-denominated bonds issued by Japanese entities. As of Sept. 29, 2016, it tracked close to 6,000 bonds, with a market value of approximately JPY 1,190 trillion.